Typically speaking when you attend a wedding, the bride & groom will bestow a small present on their guests as a thank you (on top of the free meal and drinks, mind you). General rule of thumb is the most effort your guests put into attending your wedding, the nicer the gift should be. For example, a small affair held in a friend’s backyard probably wouldn’t net the same type of favour as a lavish event at an out-of-town location. Although I’ve already got my favours picked out, I thought it might be neat to see what other creative ideas exist out there and share them with you. For this month’s 10 for $10, keep in mind, I’m not looking at items that are packaged at $10, but that break down to $10 or less per person. As an extra bonus, I’ve also included a DIY variation for all you crafty brides out there. With that, here are 10 wedding favour gifts under $10! 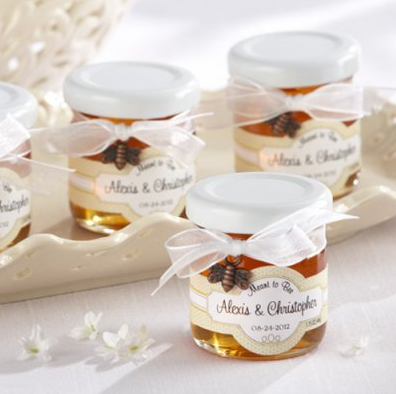 Truth be told, Beau Coup is a crazy source for all things wedding so this was a pretty easy pick…but how cute are these customized honey jars? You get to design the label including the happy couple’s name & wedding date, while your guests get to take home a sweet treat they’ll pull out many times after your big day. Perfect for rustic barnyard weddings. DIY OPTION: Visit your local farmer’s market and find a local honey supplier. Use baby food containers, print custom labels, and give a truly homespun gift. (most are in the $2.99 range)Everyone loves to munch on a sweet treat between courses – give ’em something that’ll last all night with Jelly Belly’s custom jellybean creator. Choose your container, beans, and unique artwork for a memorable takeaway kids and adults alike will love. 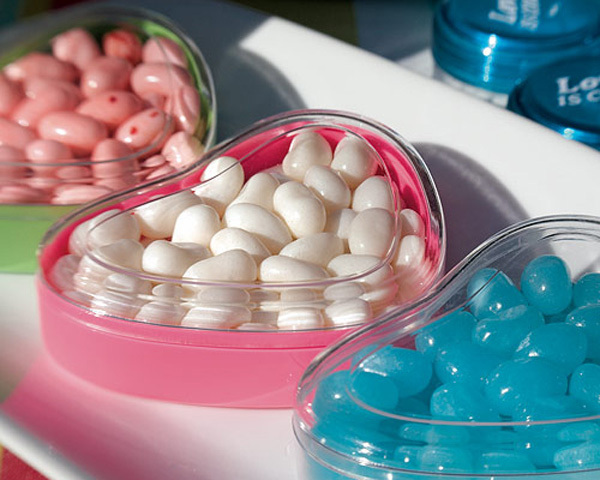 DIY OPTION: Visit a local candy store and mix and match your favourite beans that go with your wedding colour scheme. Buy cellophane bags or uniquely-shaped containers that match your overall theme for an extra coordinated touch. Having an eco chic celebration? Botanical Paperworks is a fantastic source for tons of affordable (moreso than this item really) wedding favours. These rustic burlap sack seed bombs allow you to create a custom message and spread a little love to the earth after the event. DIY OPTION: Gather your bridesmaids for a messy afternoon of making your own seed bombs. Buy burlap from a craft, fabric, or gardening store and hand paint each one. If you’re having a retro-themed wedding, imagine a table of these classic beauties lined up, filled with candies to match your fete’s colour scheme. DIY Option: Skip the machine and go for goodie bags – buy custom-printed cellphone bags and fill them with sweet treats for every guest to take home. Believe it or not those glittery orbs pictured above are actually mouthwatering morsels of chocolate bonbons – available in 6 delicious flavours and 24 sparkling shades, they’re a perfect treat for a big, glitzy, glam wedding. I also love the idea of creating a coloured candy / dessert bar expressly from their goodies (individual bonbons are available)! 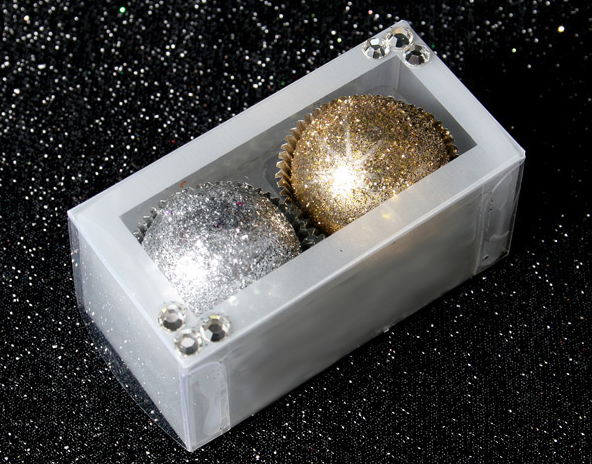 DIY OPTION: Admittedly it may be hard to find something quite so glittery to deck out your desserts with, but plenty of local chocolatiers would be happy to whip up some special truffles for you to tuck into a custom box. I love the idea of using your centrepieces as takeaways – it gives guests flexibility that may not want to haul a trinket home. 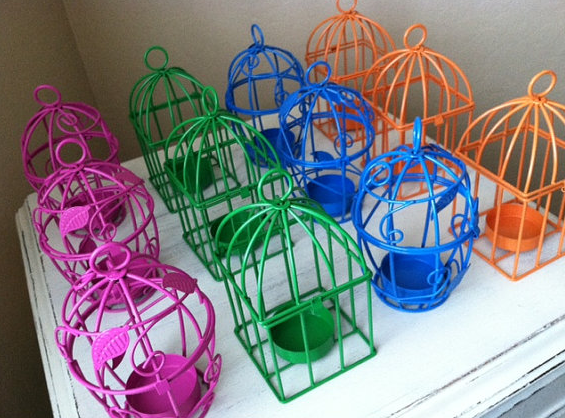 These handsprayed bird cages pull double duty as decoration and candle holder. DIY Option: Trawl garage sales and consignment stores for vintage cages & trinkets, spray paint ’em with your wedding shades, scatter about the tables for a shabby chic look and invite guests to stock up on their favourite treasures. Love, love, love these cute little metal tins of tea for a fall or winter celebration – you’ll keep your guests warm for days after with the five tea sachets contained in each little tin. Plus you can reuse the tins to keep your tea fresher, for longer. 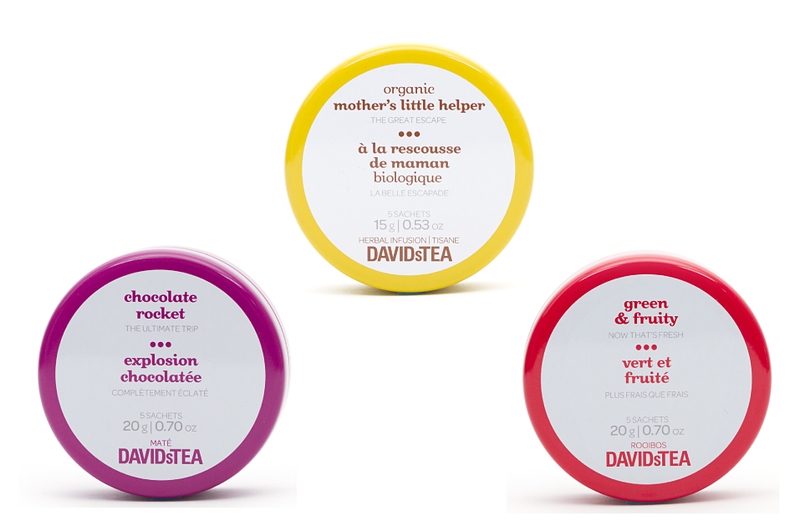 DIY OPTION: These cute tins only come in a few flavours – you can always stock up on a favourite signature DAVIDsTEA blend or another tea maker’s leaves and place them in a customized mason jar or metal tin of your own. What is this? That depends, really, on you. 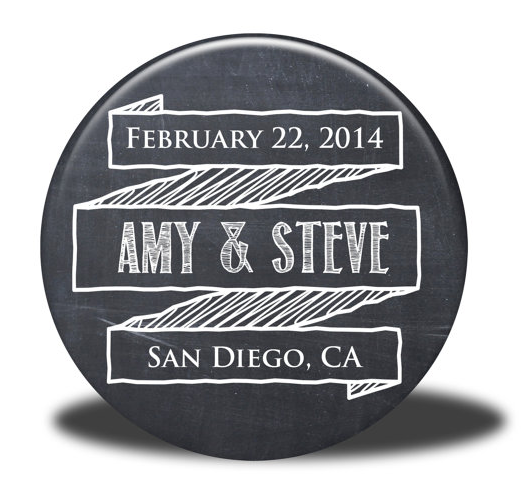 This custom-designed circle can be finished with one of four ‘backs’ to suit your guests – make it a mirror for the ladies, a button for the kids, a bottle opener for the beer-guzzlers, or a magnet for the geriatric folks. DIY Option: Buy a button-making kit and get pressing to your heart’s desire. Enlist a close pal with Photoshop skills to design the image for you. Custom Chocolate Bars – ~$5.50 each @ ChocomizeYou’ll have as much fun crafting your custom chocolate concoction as you will eating it. Chocomize allows you to mix and match chocolate flavours and toppings – ranging from nuts and fruits to more exotic choices like pop rocks, pretzels, and coffee beans – for a one-of-a-kind favour. 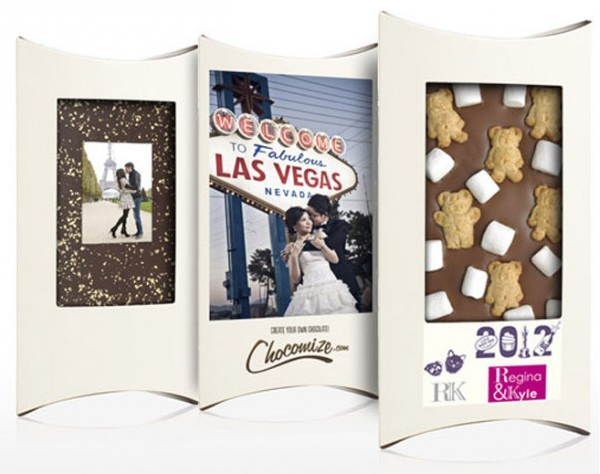 Further individualize your present with a funky custom image on your chocolate box. DIY OPTION: If you’ve got a favourite bar, buy it, strip off the outside wrapper (but leave the foil) and then wrap it with childhood photographs of you and your spouse. 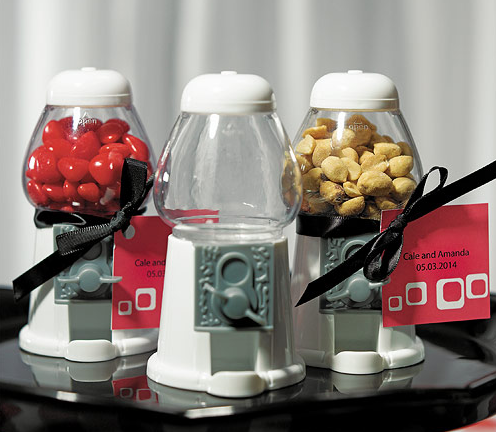 It’s a sweet way to personalize your reception. I mentioned above that centrepieces also double as great wedding favours – ditto on placecards (in fact, my own wedding will be using both). 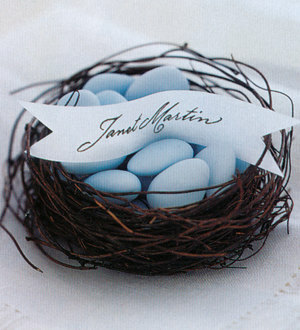 These charming birds nests are perfect for classic garden weddings. Simply fill with a printed banner & your choice of sweets (mini eggs or Jordan almonds are perfect) to round out the look. DIY Option: Visit a big box craft store – Michael’s is a pretty safe bet – and either handcraft your own nests or buy them ready-made. Gather your bridesmaids for a pre-wedding assembly line to whip up your edible placecards. There you have it! This may have been a little easier because normally speaking, you wouldn’t spend more than $10 on a single wedding favour. Still, it was a fun challenge to find 10 unique ideas across the spectrum. And with that, why don’t I present you with an extra chance to enter into the Sultra giveaway? Just tell me which of these 10 fab favours you’d most like to receive as a wedding guest (or perhaps, give, if you’re in the throes of planning and / or dreaming). I would love getting the little Gumball Machine ! My chcolate taste buds call out to the Two-Piece Truffle Box. Love the custom chocolate bars – can never go wrong with chocolate! Boy this is a tough one ,you really picked great items. What would I like to receive? Love the truffle boxes, the meant to bee jars & the David’s tea tins. Can I have all 3? I’m not greedy,lol. I like the custom chocolate bars. The custom chocolate bar is so unique..love it! I like the Meant to Bee honey jars and the two-piece truffle box. Sultra bonus entry: of these 10 fab favours, I’d most like to receive as a wedding guest is the “Custom Chocolate Bars – ~$5.50 each @ Chocomize” … yummy! 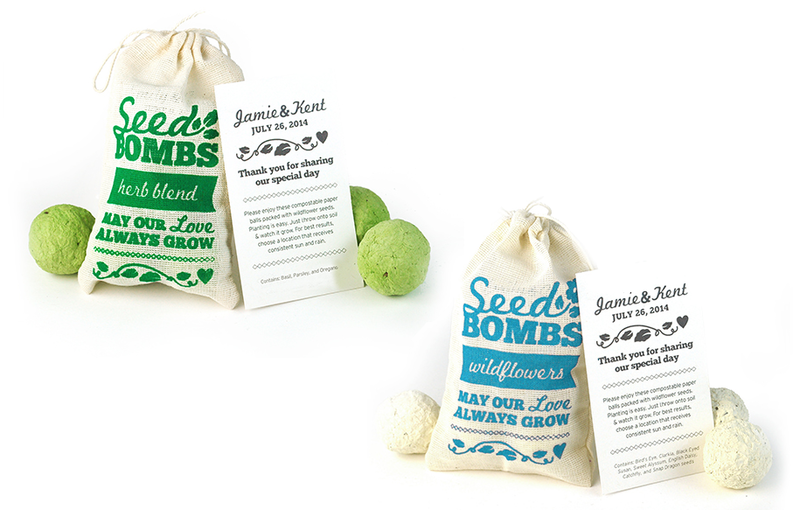 I like the seed bombs–what a great idea! Thank you for including my little birdcage tea lights! 😉 Great ideas! I like Two-Piece Truffle Box for a wedding. Love the GOLD/SILVER!! NICE!